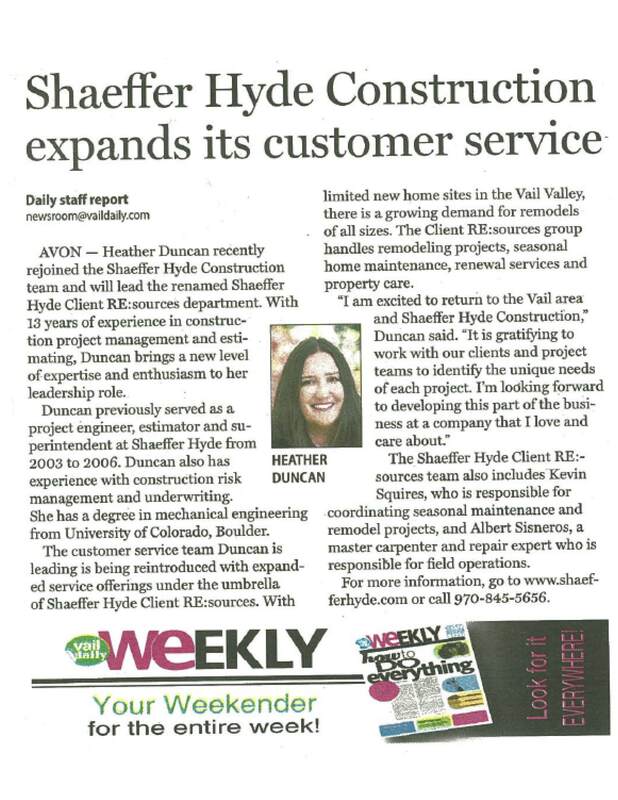 As our Colorado mountain community concluded 2014 and began what will undoubtedly be an exciting winter season, Shaeffer Hyde Construction wrapped up our landmark 35th year and geared up for 2015 by remodeling our customer service department as Shaeffer Hyde Client RE:sources. Shaeffer Hyde Client RE:sources is an extension of our core team of construction and project management professionals. This team will be the asset you turn to when you need to get something done for the mountain home that you love. Our goal in presenting Shaeffer Hyde Client Resources is to provide services to both new and existing clients including detailed improvements, the addition of value adding elements, or updating a space such as a kitchen or powder room. We are pleased to introduce Heather Duncan as Client Resources Department Manager. Heather has accepted the position, having previously been employed as an Estimator and Superintendent with the company. Heather focused her education on Mechanical Engineering. In addition she has extensive experience in Construction Risk Management and Underwriting. We are thrilled to welcome her back and into this role at Shaeffer Hyde construction! If you are considering a project let Shaeffer Hyde Client Resources be at your service. Contact Heather at 970 790 1534.